There are so many amazing board games for kids these days, knowing which one they will love the most can be a monumental task. We are here to help with some FAQs parents often have when it comes to finding games for their children, and have also provided detailed reviews of over 10 popular games. We have chosen games which are easy enough for kids to play with their friends, as well as those which can be enjoyed by the whole family as part of a games night. Read on below to find our picks of some great games for 6 year olds. 0.1.2 Is the game replayable? 0.1.3 How easy is the game to set up? 1.6 6. Hasbro Guess Who? 1.12 What are the Benefits of Playing Board Games? When buying your child a board game, there are lots of things you should look out for. We will take a look at some of the main factors to keep in mind below. The first thing to look out for is what the game is about, is it appropriate for a 6 year old and will they enjoy playing it? Virtually all board games come with a suggested age range, and we recommend paying attention to this. If your kid aged 6 has a lot of experience with games, they might manage a game which is suggested for kids aged 7 or even 8 and above. However, in general, it is a good idea to stick to the suggested age range. Your child might get bored of a game if it doesn’t have a high replay value. For example, some quiz games have limited questions and your child might soon learn all the answers. Other games which involve challenge cards can sometimes be completed in a short period of time. However, some games have expansion packs which allow the game to be more replayable to provide even more entertainment value. How easy is the game to set up? Draw yourself to games that are popular, family friendly and easy to set up. Clear rules are a must, it is not going to be fun if you do not understand how to play and have to constantly check the rule book. Kids will get bored if the game has a lot of rules to learn before they start playing. They might also not have the patience to set up a game with many parts and pieces. 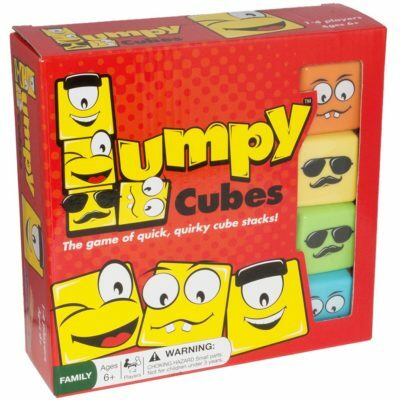 Lumpy Cubes Family Board Game is an extremely affordable and creative game for children ages 6 and up. It comes with 16 plastic cubes, very simple instructions, a plastic storage tray and 12 stack challenge cards. This game is a stacking game and it is designed to improve your memory and motor skills. It makes learning fun and it is amazing entertainment for any occasion. Lumpy Cubes board game is fun to play and learn with and makes an amazing gift. This game is highly recommended by parents. Some say it is the ‘perfect game’ for a family night. It is an award-winning game. This game is not suitable for children under the age of 3 due to small parts. You can even have up to 4 players so play against a family member or friend! Don’t step in it is a tremendously fun and unique game for kids ages 4 and up. It retails for a very moderate price and is currently on sale. This game comes with colorful soft clay, a spinner, a floor mat, and a blindfold. This game is described as ‘hilarious’ and has ‘messy consequences’ with hours of fun. Place the unicorn poop (clay) on the plastic mat, spin the spinner whilst wearing the blindfold and take as many steps as the spinner says trying not to step in the colorful poop! It is very easy to play and kids love it. This game is fun enough for adults to join and is a great game for a family game night. Don’t step in it is the perfect Christmas or birthday gift and is excellent for kids parties. 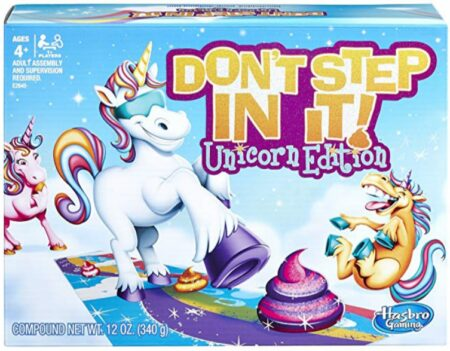 Parents highly recommend this game, especially for kids who are obsessed with unicorns. You can even mix up the clay and buy your own colors, maybe even add glitter! This is one of the best games for 6 year old girls who love unicorns – as most of them do! World of Disney is a fun, inexpensive game for kids aged 5 – 6 years old and up. This game encourages teamwork and it is designed for 2 to 6 players. It comes with 1 spinner, 4 mover bases, 4 movers, 1 six-foot game board, 10 Mickey Mouse ear tokens, 1 sand timer, 30 search cards, and a game rules manual. It is not suitable for kids under the age of 3 due to small parts that cause choking hazards. Wold of Disney is a family favorite and all of the Disney characters are well known. It is a spectacular gift and is full of fun. Throughout the journey of this game, each player searches for Disney objects. There are over 1000 secrete treasures to find! This game is perfect for building up confidence and engaging with other people playing. This is an award-winning game and highly recommended by parents. Jax Sequence States and Capitals is a tremendously fun, learning game for kids. It retails at a very affordable price and is currently on sale. This game helps you learn the States and capitals the easy and fun way. You can play this game with 2 to 12 players. In this game, you need to match the state on the board with the capital on your playing card. Once you have done this, place a counter on the space. Once you get 5 counters in a row, you win! This game comes with counters, a game board, and state cards. This is a brilliant game to test your knowledge on the USA. The more you play, the more states you remember. This game is not suitable for children under the age of 3 due to small parts. This is a great game to enjoy with the family and is highly rated by parents. It’s the perfect educational board game for 6 year olds who are curious about their country – it helps your child learn geography that they will remember for a lifetime. ThinkFun Rush Hour is an enjoyable and very affordable game for kids. It is suitable for both boys and girls and is a great game for learning. This toy includes an ice cream truck, 40 challenge cards, a traffic grid, 15 blocking vehicles, and a storage bag. This is a brilliant present for any occasion and has clear comprehensible instructions. The instruction manual is very easy to read and amazing high quality. This game has multi-level challenges. It comes with 40 beginners to expert challenges. These challenges increase in difficulty as you play your way through the game. 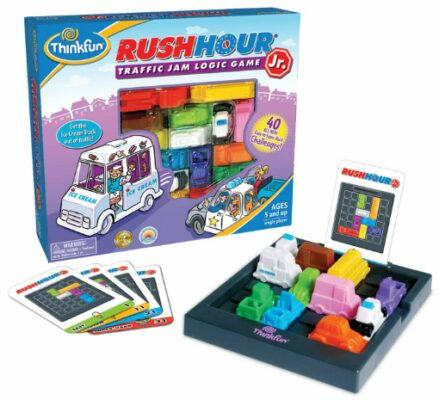 ThinkFun Rush Hour is an award-winning game highly recommended by parents. This game was built to develop thinking skills and improve planning skills by playing a fun board game. ThinkFun Rush Hour will give your 6-year-old great independence and is wonderful for challenging young minds. It’s one of the 6 year old boys and girls best board games for those who love solving puzzles and brain teasers. Hasbro Guess Who is an extremely cheap and cheerful game for kids aged 6 and up. It is a classing guessing game. In this game, the players have to guess each other’s character by asking yes or no questions. ]The first person to guess the other player’s character first wins! This game is a 2 player game and includes 48 face cards, 2 plastic game boards, 2 scorekeepers, 24 mystery cards and a clear instruction manual. This game is not suitable for kids under the age of 3. Hasbro Guess Who is a great Christmas or birthday gift. It is also a brilliant classroom game. This game is highly recommended by parents and gets your child interacting with other people. 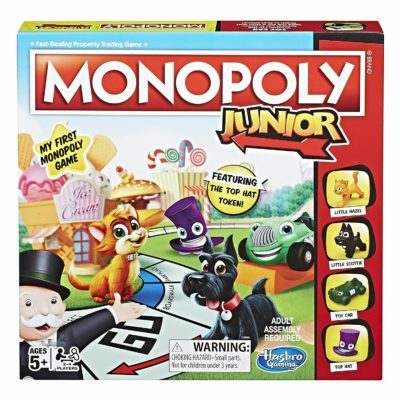 Monopoly Junior is a fun-filled game for kids aged 6 and up. It is very affordable and simple for young ones. This is a faster Monopoly game is designed for young kids. This game has children-friendly locations and properties. They have locations such as the zoo, paddle boats, pony rides, a gaming arcade, a movie theatre and many more. This game is enjoyable for the whole family and is brilliant for a game night. Monopoly Junior is an amazing gift for any occasion. Due to small parts, this game is not suitable for kids under the age of 3. It is a great learning game too because the children have to count up their money when they buy new properties. This game is highly rated and recommended by parents. Some have described it as ‘a great game for youngers’. Players take their turns in order with the youngest taking the first go. Every time someone passes or lands on ‘GO ‘ collects 2 monopoly money from the banker. 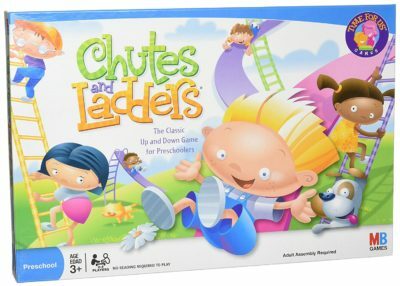 Chutes and Ladders is an exciting game that retails at an affordable price and is currently on sale. It is for kids aged 3+ and up. This game is a great game for kids who have not yet learned to read. This game is a 2 to 4 player game. You start with a token on square one and travel your way across the board. As you travel across the game board to reach the top, children can practice their counting. The first person to reach the top of the board wins! This game is approved by parents and they say it is great fun for their young ones. If you land at the bottom of a ladder, you go up the board. If you land on a chute, you go down the board. This toy contains a marble so is therefore not suitable for children under the age of 3. This is great family fun and makes an awesome birthday or Christmas gift. This game will keep children happy and quiet for hours. This game includes a game board, 4 tokens, and a dice. 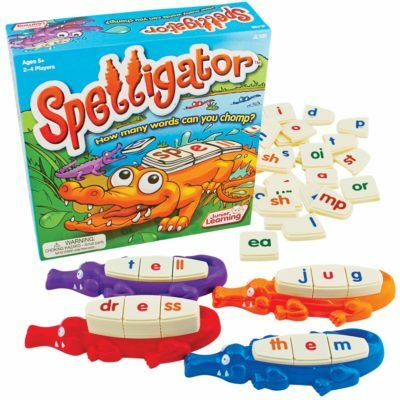 Junior Learning Spelligator is a little bit pricier than the other games but well worth the money if you are looking for a game to help with your child’s learning. This game is suitable for children aged 6 years and up and it includes word building, sounding out words and spelling rules. This game teaches kids different letter combinations including vowels and consonants. Parents say this game is brilliant and a fun concept for young kids. It makes a perfect gift for any occasion and is excellent for classrooms. This is one of the best games for six year olds who are keen to improve their spelling skills. Clue Junior Game is an affordable board game currently on sale. This game is suitable for kids aged 6 and up and you need 2 to 6 players to be able to play. This is an easier version of the very popular game ‘clue’ for kids. Somebody ate the last slice of cake and the players have to find out who did it, what they drank with it and when they did it. This game includes the gameboard, 6 furniture tokens, 6 characters, 7 yellow and 7 white bases, a detective notepad, a dice, instruction, and a label sheet. Keep uninflated balloons and small parts away from young children due to choking hazards. The children take on the detective role and uncover clues throughout the game. The player to solve the suspicious mystery wins the game. Clue Junior Game is the perfect family game to introduce kids to the basic logic of games. It is full of enjoyment and fun for the whole family to enjoy. Mouse Trap Board Game is one of the best board games for kids age 6 and up. To play this, you need at least 2-3 players and it is suitable for both boys and girls. The aim of this game is to get your mouse around the gameboard without getting caught in a mouse trap. Players take it in turns to build the mousetrap and use it to catch other opponent’s mice. The last uncaptured mouse on the board is the game winner. This game is not suitable for kids under the age of 3 as it includes small parts. Mouse Trap board game comes with 3 board game pieces, a cardboard spinner, 3 mouse figures, a tub, a cheese wedge spinner and base, a tree trunk, banana branch, a ladder, a cheese wedge slide, 2 marbles, tree leaves a seesaw log and clear comprehensive instructions. Once it is set up, it is a brilliant fun-filled game to play. Adult help is required when putting it together. Parents highly recommend this game for young ones and say that their kids were full of interest and lots of laughter was involved. This is the perfect gift for any occasion and it is a fantastic classroom game. There are many benefits attached to playing games, so let’s take a look at some of the reasons why playing board games is important for young children. When you play as a family, you are spending more time together. It helps strengthen the family bond and is an excellent way to get together. You are spending less time in front of a screen. This is extremely important for their mental and physical health. Children love to win and can become upset when they lose. It is your job as a parent to explain to them that it is just a bit of fun and losing a game does not change you in any way. Children can also learn to take turns and share. If the game involves playing on teams, they will be able to practice communicating effectively with their team-mates. Playing games helps children improve many different skills such as counting, speech, eye contact, letter recognition, reading and many more. Lots of games are designed to be educational, for example there are counting and adding games which help get kids interested in math. Others are not designed specifically to teach, but kids can gain valuable skills just by playing. For example, many games help kids learn skills such as problem solving and reasoning. Because there is such a wide selection when it comes to games for 6yr olds, it’s important to choose one your child will really love! Here, we look at some ways to help decide which game will interest them the most. It could be a favorite animal or character, or a subject they are interested in. 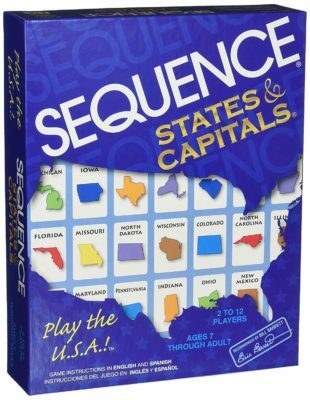 For example, if your child is interested in geography, the Sequence capitals game is a great choice. All kids have different likes and dislikes, so there is no one perfect game which will suit all kids – you know your child best. If your child is struggling with math at school, getting them a math game can help get them interseted and make learning fun. You might also like to choose a game which involves interacting with other players if your child can be a little reserved. There are loads of games which will teach your child something new, so there is sure to be something that fits the bill! It can be fun for siblings to share a game together, and it will help keep them out of trouble! You can try to choose something which suits the ages of all your children. They will bond over playing a game together, and it means everyone can get involved when it comes to family games night.